During Heritage Weekend I attended a performance of History Wardrobe’s White Wedding – another fantastic event, but more of that later apart from the event was held in Wakefield Cathedral. Wakefield Cathedral being the link to my post. I arrived early, so I thought I would ‘kill one bird with two stones’ as they say and off I went looking for a memorial to a WW1 soldier, that a relative of his had lead me to believe was there. I hasten to add the last time I visited with the aim of searching for this memorial it was the previous year’s Heritage Weekend, and the building was partially closed for renovation work. Well, with time to kill I set off on my mooch around but sadly the memorial could not be found – I walked up and down but no, it was not there. Had the relative mistaken the church, was it in another within the vicinity – note to self, send her an email! As I have said, I walked up and down the Cathedral looking for this memorial but on one aisle there was a short row of chairs – why were they there? Well, with a History Wardrobe event and my new find I was well made up for the day. It seems that my find was part of a five-year touring installation commemorating the casualties of WW1 – What a find as I had not seen this advertised or promoted anywhere. The installation comprised of five chairs from Passcendaele’s St Audomarus Church – each chair represents a casualty as shown by the small numbers on each chair, Accompanying the chairs is a book – each left-hand page bears the name of all the casualties from the British Isles who died in Belgium, some 173,000 names, with each name being followed by the regiment and date of death. The opposite page of this huge book is for personal stories, and there are some wonderful ones told by relatives and researchers. Some of which I will tell at a later date, but in the meantime, I will tell of someone from the left-hand page, whose family name has a connection to me. RIACH – J Riach of the West Riding Regiment – did he have a connection to my Scottish Riach family? I did know that some of the family moved to the Brighouse area of Yorkshire and others went to the London area. Did J Riach belong to the Yorkshire, London or Scottish side? 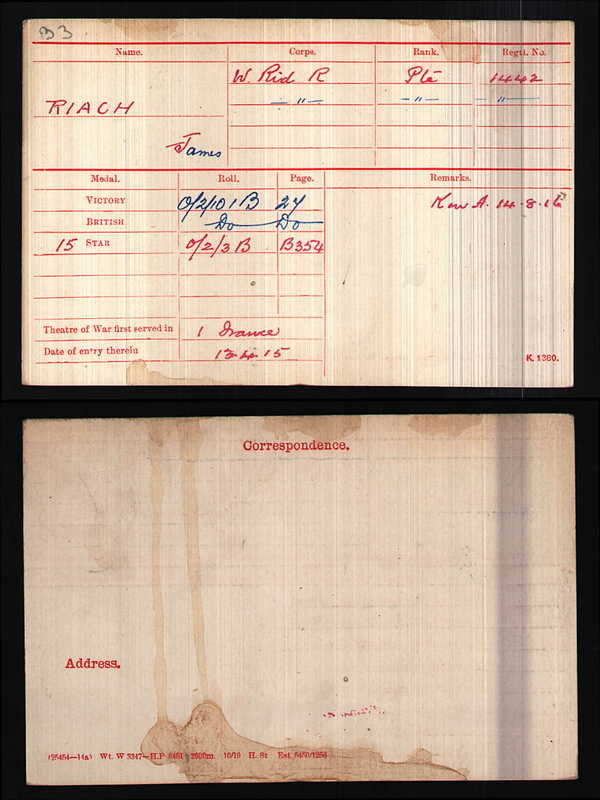 The medal card for J Riach confirms his service number, always a good start and gives his first name, James (the CWGC only gives his initial). Did James have a surviving service record? Yes, he did and this told me that he was born in Fochabers, but at the time of his enlistment was living at 35 Birkby St, Wilson Road, the town being unreadable! Having previously resigned twice from the services. James was working as a mechanic for J G (?) Sharp after serving a five year apprenticeship at E Fairburn’s in Brighouse. James, aged 34 was 5′ 5½” tall and considered to be in good health. He appears to have been a stocky man as his chest was 41″, his medical report was signed off in Halifax and enlisting in Brighouse – proving which line of the family he comes from. 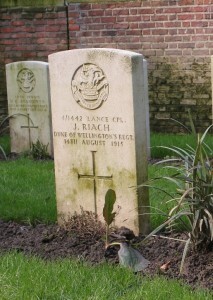 And so James Riach signed his name and became Private Pioneer James Riach of the West Riding Regiment, serving as , witnessed by Harry S Atkinson Commanding Officer. 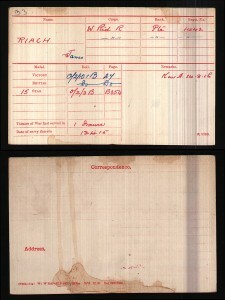 Further reading of the service records tells that the enlistment at Brighouse was on the 24th of July 1912. James had attended annual training in Flamborough and Aberystwyth, sadly the dates have been erased by water damage but appears to have been discharged in 1902 after serving two years, of which some time was in South Africa, due to being under height. James embarked as part of the BEF from Folkstone on SS Invicta on the 14th of April 1915 for France and Belgium, after serving ‘At Home’ from the 5th of August 1914 – 12th of April 1915. In July of that year, he was appointed in the field, unpaid Lance Corporal. Just over a month later he was killed in action. As of yet, the name of James’ wife is unknown, but a receipt for one of his medals is signed for by A L Riach – could A L be Ada Louisa Macaulay who married James in St Mary’s church, Elland on the 26th of March 1894. James was the son of John, a police constable, while Ada was the daughter of Frederick, a dentist. It looks like it is as another paper has the full name of his wife and the full address – Mrs Ada Louisa Riach, 25 Birkby Street, Wilson Road, Wyke, Bradford. Don’t you feel a sense of satisfaction when firstly, the service record you want has survived and secondly when the page containing the relatives is intact and readable – pure joy and worth a celebration. This page was completed by Ada after James’ death and lists his children, his father and a full list of all his siblings and their addresses. By the time this form was completed on the 20th of July 1919, Ada was now living at 11 Norwood Street, Bankfoot, Bradford. Most of his siblings had stayed around the Brighouse and Rastrick area but the odd one had moved just up the road to Clifton and one to Gomersall, but still quite close to the family hub. Ada was given a pension of 21/- a week for herself and two children – strange as the list of children on the previous sheet clearly, states that there were three children to the union of James and Ada – what happened to the third? One other piece of information I found about James was in the Leeds Mercury dated 20th of August 1915 and reads ‘FRIENDS KILLED TOGETHER. News is to hand from Belgium that Corpl. Norman Hirst (Clifton), Lance-Corpl James Riach, and Private Charles Lee (Wyke), of the 1st-4th West Ridings, were killed by a German shell on Saturday last, while working on a dug-out. Two other men were wounded by the same shell, and it was while assisting the stretcher-bearers to get these away that Capt. Andrews (headmaster of the Hipperholme Grammar School) was fatally shot by a sniper‘. 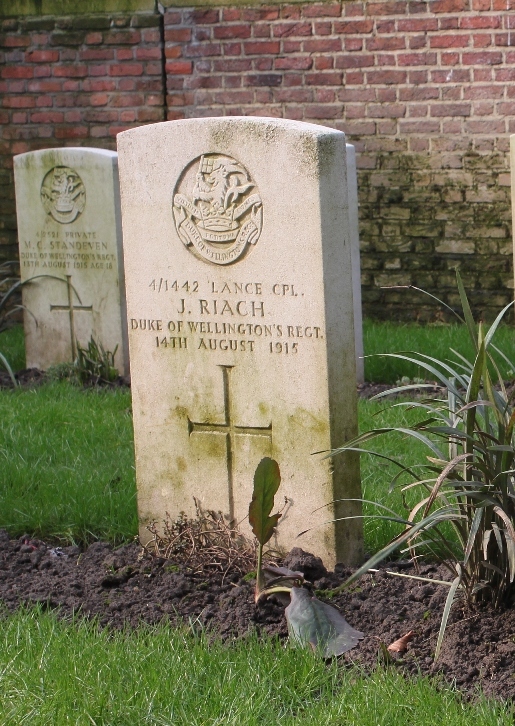 Riach was instrumental in getting Lee to enlist, both men being employed at the same works and living in the same street, and it is a notable circumstance that they should have been killed by the same shell. James is now no longer a name in a book or a name on a headstone, he is a son, a husband, father, neighbour and workmate. Did Ada re-marry? No, she died in 1958 aged 86 in Bradford and was still known as Ada Riach. She is listed in the Probate Calendar with the following entry ‘ RIACH Ada Louisa of 4 Hillam Street Little Horton Bradford widow died 31 May 1958 at Thornton View Hospital Bradford Probate Wakefield 19 August to James Riach gentlemens outfitter and Geoffrey Gostick solicitors managing clerk. Effects £1107 9s. Note : there is no punctuation or very little in the Probate Calendars. James, my distant cousin, is remembered on the war memorial at St Mary’s Wyke along with Charles Lee who served as Private 4/1679. I had previously written about the Riach family of Brighouse but since then I have managed to find out a bit more about one member of that family, with other bits of information being amended due to better-scanned images now being available online. This entry was posted in General on November 12, 2016 by carol.